Is that an airport or the home of the 2010 Bass Masters Classic Fishing Tournament? Sure looks like a lot of water down there. Do the Southwest planes have skids? Go away, people like you dont fly anyway cowboy. 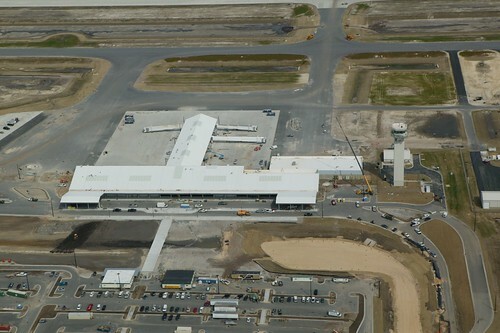 I love the new Airport!! It looks great and no question if Panama City Beach is to move into the twenty first century, it is needed as a foundation for residents and businesses to build on; but the Airport still has a rain water problem they needs address. Expanding the last picture on the far right, which looks across the runway to the terminal and beyond; you can clearly see the rain water track running from the terminal, across the runway, to the holding pond at the bottom. I’m sure the FAA with not allow this condition to exist if the Airport is to open. CORRECTION – After blowing the picture up it becomes quite clear it’s not a low spot in the runway that rainwater cuts across, but truck tracks – they are still moving dirt around the airport boundaries. Right now they have plenty of room in the holding ponds for additional rainwater runoff. I wonder with all the holding ponds if we are going to have a bird problem? I don’t see how they can keep birds away from the runway with all that water so close to it. Other Airports have a big problem with that. We’ll have to wait and see how this all pans out. If the airfare prices are no better than the old airports (high), and I hear they are not, I don’t see much changing. I cought a huge bass just north of the tower last week. Sweet! 1st I will say rates have not come down, they actually doubled for my sister in laws flight here . Exact same dates in May of 2009, price was less than $400 round trip on Delta, this year 2010 flying into and out of new airport fare is more than $800, so much for the lower fare hype. Yesterday it rained really hard and reports are the carpet in the main terminal are soaked! This is absurd, if it floods everytime it rains 4-6″s there will be water in the terminal several times a year. I guess I can live will getting my feet wet in the terminal, but the double on fares is a kick in the a$$. Where is it located? Live in AL and have reservations with SWA the end of May.